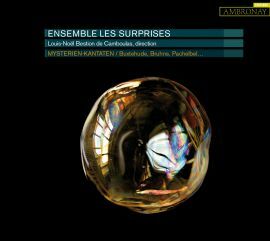 Taking its title from Biber’s Mystery Sonatas (although not actually including any of those pieces), this recording from Les Surprises delves into the mysteries of life and death with an exploration of late 17th-century North German sacred cantatas of Buxtehude, Bruhns and Bernhard. What was particularly interesting for me to listen to, as an organist, were the arrangements of two well-known ground bass organ pieces for instruments. The CD opens with a version of Pachelbel’s Ciaconna in F minor, based on a repeated descending four-note bass line. We are then plunged straight into the world of death, with the Klag Lied, Buxtehude’s extraordinarily moving reflection on the death of his own father, whose last days were spent in his son’s home in Lübeck. It is followed by Nicolaus Bruhns’ cantata for bass voice meditation on death, De profundis clamavi and the second of the instrumental arrangements of organ pieces, Buxtehude’s Passacaglia in D minor. The programme notes (perhaps rather too unquestionably) the admittedly rather good theory that this is based on the lunar month and the phases of the moon, with its 28 variations and four sections, each with a distinctively different mood. The remaining two cantatas reflect a more positive view of life, rather than death. Christoph Bernhard, a friend of Buxtehude, was better known as a music theorist than a composer. His duet cantata Wohl dem, der den Herren fürchtet shows the Italian influence of this former pupil of Schütz, who had met Carissimi in Rome. Heinrich Scheidemann’s Praeambulum in D minor is given a fascinating performance on a claviorganum (a combined organ/harpsichord), the use of the distinctive Regal organ stop contrasting with the sound of the harpsichord. Buxtehude’s cantata for soprano Herr, wenn ich nur dir is also built on a six-note ground bass in the form of a chaconne. Music using a ground bass has an almost hypnotic effect, in the case building to a jubilant Alleluia. The recording finishes with Johann Adam Reincken’s five-movement Sonata Prima from his Hortus Musicus set of six sonatas. The young Bach knew these pieces, and transcribed two of the movements for harpsichord, adding his own ornamentation, which is used in this performance. I have reviewed Les Surprises several times, live and on CD, and have always been impressed. The two singers, soprano Maïlys de Villoutreys and baritone Etienne Bazola blend well together and excel in their solo cantatas, while the five instrumentalists, who have important roles in the cantatas, as well as the instrumental pieces, are equally excellent. They are Marie Rouquié and Gabriel Ferry, violins, Juliette Guignard, viola da gamba, Etienne Galletier, theorbo, and Louis-Noël Bestion de Camboulas, director and harpsichord/organ.